There are two things that I always have ingredients for and that would be for pasta and pizza. I always have a backup of every kind of pasta, like it’s an emergency situation, and I always have onions and garlic and veggies and lucky for us Pepperoni. I also have a boatload of yeast. Yeast that I have won, yeast that I am trying in new baking recipes and yes, Pizza Crust Yeast. Yes there really is such a thing! Combine 1 cup flour, sugar and salt in a large bowl. Add water and oil, mix together until well blended, about 1 minute. Add gradually 11/2 cup flour until soft dough is formed, will be slightly sticky. Add additional flour if needed to form dough ball. Knead on a floured surface adding additional flour if needed, until smooth and elastic, about 4 minutes. With floured hands press out dough on greased baking pan. Top with your desired ingredients. 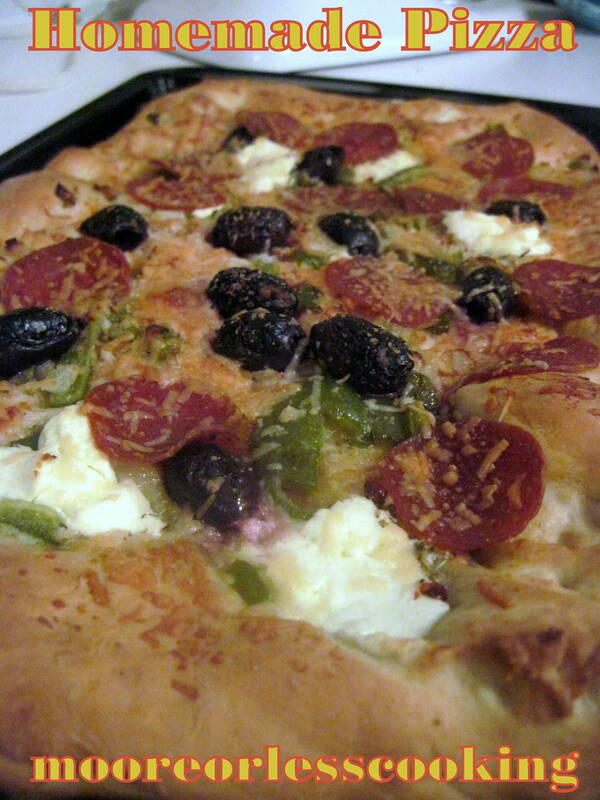 For this pizza I chose, sauteed onions and peppers, goat cheese, Pepperoni, Kalamata Olives and Parmesan Cheese. Bake on Bottom Oven Rack for 12-15 minutes until cheese is bubbly and crust is golden brown. Makes 8 slices, or squares of pizza. Wow babe, Greek pizza yum!